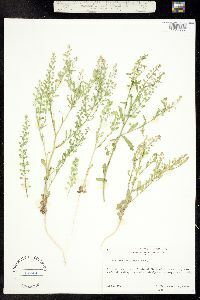 Duration: Annual Nativity: Native Lifeform: Forb/Herb General: Annual herb, 15-40 cm tall, from a slender taproot; stems few to several per plant, erect to ascending (sometimes outer stems decumbent), and branching above the base; herbage hirsute to hispid with unbranched hairs. Leaves: Basal leaves petiolate, not forming distinct rosettes, usually early-withering; stem leaves alternate, usually short-petiolate; blades oblanceolate, 1-8 cm long and 4-30 mm wide, pinnatifid to dentate, the uppermost leaves sometimes entire. Flowers: Small and white, in multiple terminal racemes, each 2-10 cm long, often crowded on larger plants; pedicels flattened, 2-4 mm long, glabrous or pubescent; sepals 4, oblong, 1 mm long; petals 4 in a cross formation, 1 mm long, white. Fruits: Capsules round to ovate, flat, 2-3 mm across, with notch at the tip; persistent style absent or present but inconspicuous, 0.1 mm long, much smaller than the notch where it sits; seeds brown, ovate, 2 mm long. Ecology: Found in playas, washes, arroyos, beaches, saline soils, roadsides and other disturbed areas, below 6,500 ft (1981 m); flowers February-May. Distribution: CA, NV, UT, AZ, CO, NM, w TX; south to C. Amer. 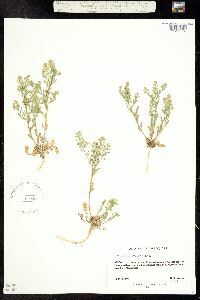 Notes: Lepidium is a genus in the mustard family with distinctive small, round, flat seed pods and small white flowers. The primary characteristic that distinguishes L. lasiocarpum from other similar species is its flattened, hairy fruiting pedicels (use your hand lens). It is also distinguished by this combination of traits: plants are taprooted annuals; stems and leaves are hirsute to hispid but not covered with scurfy scales; upper stem leaves are sessile to short-petiolate but not clasping the stem; racemes are erect and located at branch tips; flowers have only 2 stamens; seed pods are hairy, at least on the margins, and are not wrinkled. There are 2 subspecies: subsp. wrightii has seed pods covered in pustular-based hairs, and subsp. lasiocarpum has seed pods with non-pustular hairs. Ethnobotany: Plant used as a disinfectant; seeds were gathered, ground, parched, and eaten in a variety of ways. Synonyms: None Editor: SBuckley 2010, FSCoburn 2015, AHazelton 2017 Etymology: Lepidium comes from the Greek lepidion, meaning "a little scale," in reference to the flattened shape of the seed pods; lasiocarpum means having woolly seeds or fruits.